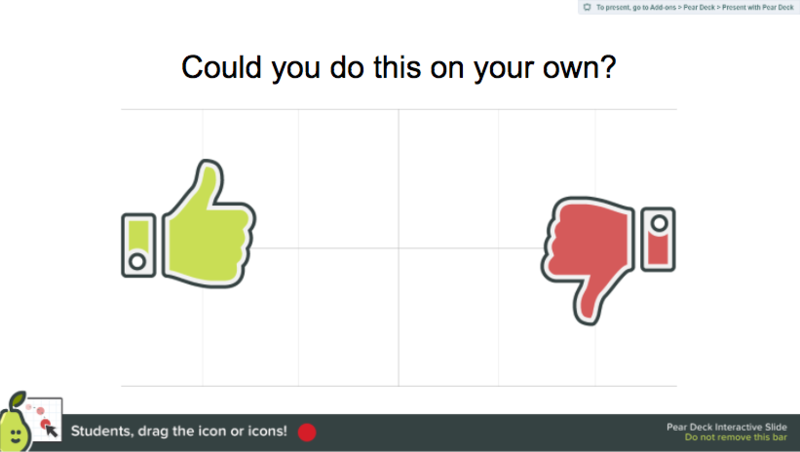 Our team of educators created the Formative Assessment Templates in our Slide Library. These pre-made templates are organized by the beginning, middle, and end of lesson. There are also templates for sharpening critical thinking ability on any subject. 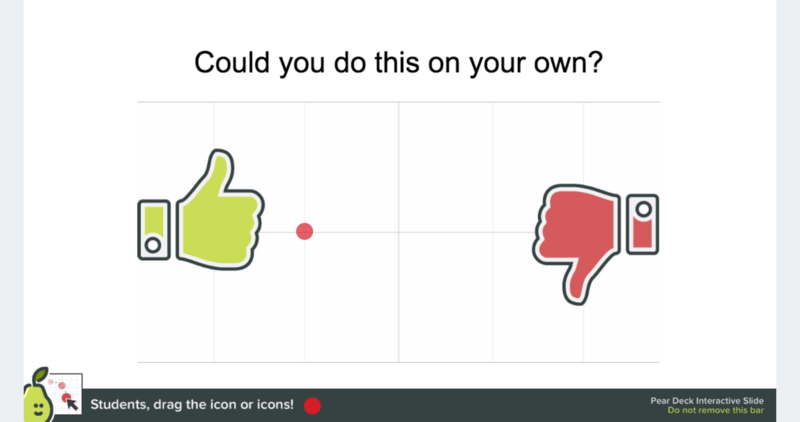 First and foremost, get the Pear Deck for Google Slides Add-on! 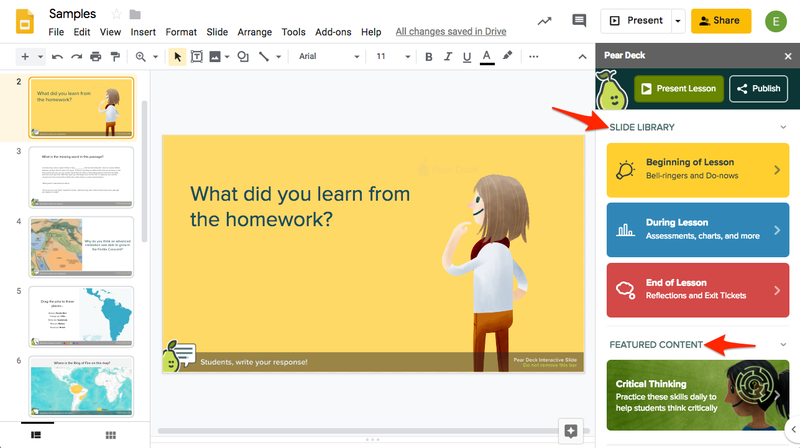 After installing the Add-on, go to the Add-ons menu in Google Slides each time you want to add a Pear Deck slide..
Click Pear Deck > Open Pear Deck Add-on. 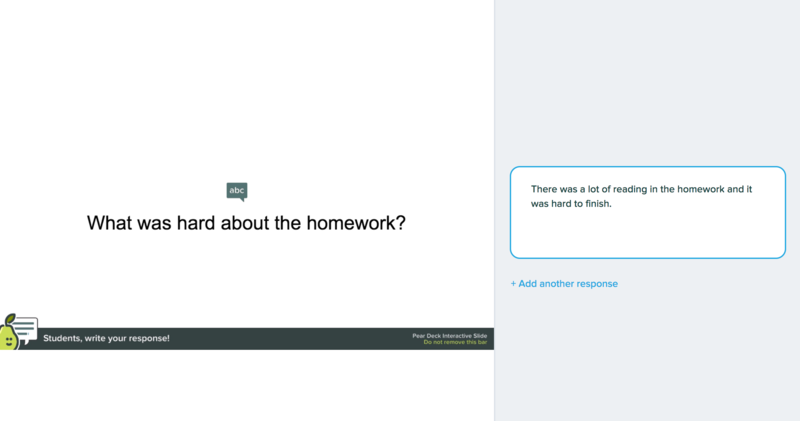 The Pear Deck Sidebar will open. Go to the Slide Library and to browse templates and select the ones you want to use. This group of templates can be used to introduce your lesson and get minds moving. These include easy-to-use warm-up, temperature check, and reflection slides. Slides in this section could be used to prompt additional thought, discussion, or deeper engagement. Slide types include true/false, checks for understanding, summary, diagrams, maps, graphs, and more. These flexible slide types can be customized to an unlimited array of subjects. Wrap up class with opportunities for reflection and exit tickets. Can you change the background image, text or question type on a slide from the library? Yes! You can customize a slide from the library the same way that you change any other image. These templates are meant to jumpstart your use of interactive questions so you can create amazing moments of classroom collaboration and engagement. You can change the question, font, theme, text color, background image - anything you want! Note: Do not delete the bar at the bottom of the slide with the Pear on it. If you delete that bar, your slide will no longer be interactive. 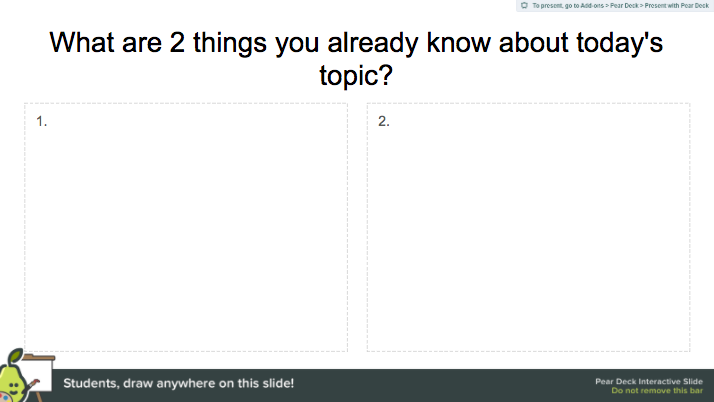 The Warm-Up Slide template is a great way to get students accessing prior knowledge about the day's topic. Students respond by drawing on the slide. Feel free to add or delete drawing areas and change the question. The Reflection Slide template gives students an opportunity to think about something and put their thoughts down in words. Students respond by typing in a text box next to the slide. 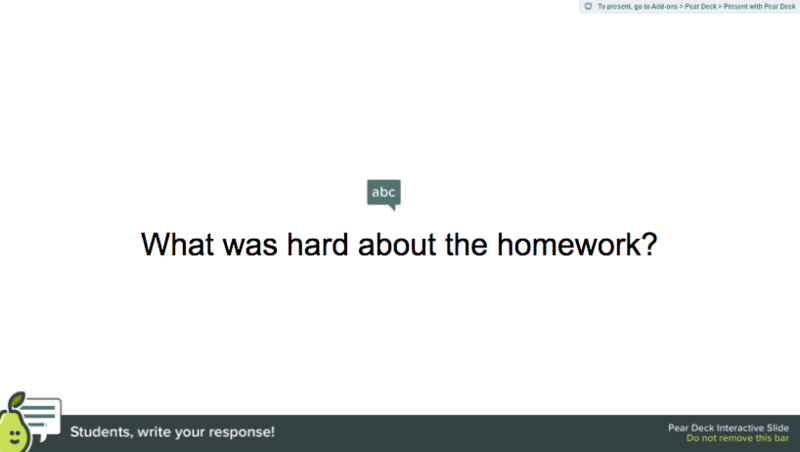 Feel free to change the question, add images or backgrounds, and delete the little "abc" speech bubble. The Temperature Check template is good for getting a quick read on your class. Are they getting? Not getting it? Ready to move on? Students respond by dragging a dot to a spot on the slide. Feel free to change the question, change the thumbs up/down image, or alter background colors. The Exit Ticket template lets you see what students are taking away from the lesson and hopefully helps the main takeaway sink in before they're off to the next class. 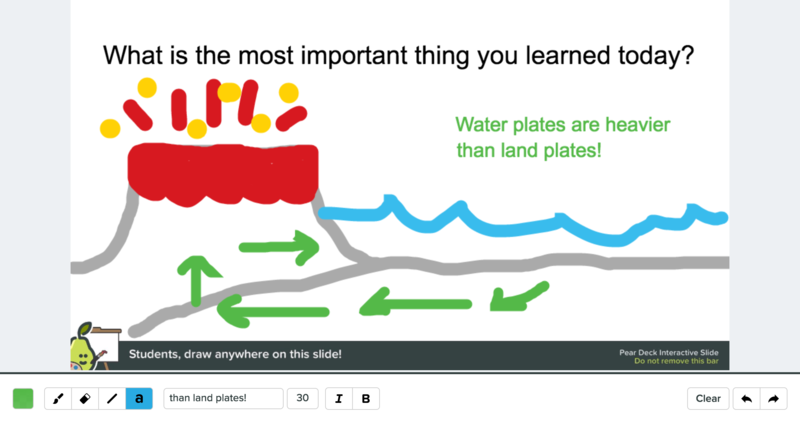 Students respond by drawing on the slide. Feel free to change the question, add multiple boxes for them to draw in, or alter background colors. And that's it! 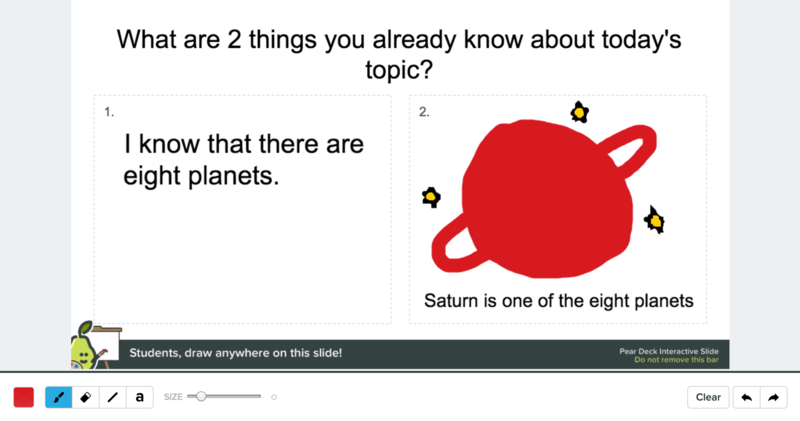 You've learned about the Formative Assessment Templates in Pear Deck for Google Slides!